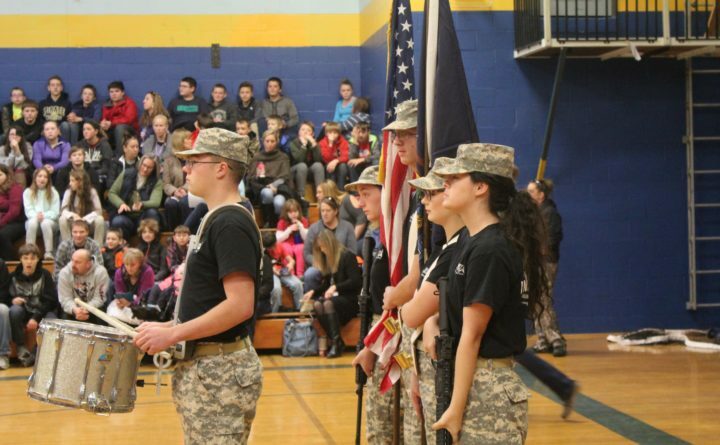 GUILFORD — The students and staff of MSAD 4 are inviting area veterans and the general public to attend their annual Veterans’ Day Celebration at 8:30 a.m. Friday, Nov. 9, at Piscataquis Community High School. Keane also requests that any Veteran who did not complete his or her high school education contact him at the school (876-4625), hinting that there may be some additional honors as part of this year’s program. Organizers note that this year marks the 100th anniversary of the end of World War I and the PCHS National Honor Society will provide a program of recognition. Students from the TCTC Criminal Justice Program will open and close the program by formally posting and retiring the colors under the command of Colonel Steven Spaulding. The celebration includes the traditional patriotic music, student presentations, and selected readings that will feature students and staff from grades three through twelve. The Armed Forces Medley Salute performed by the PCHS Band typically brings the entire audience to its feet as the school and community honors all veterans and those who serve in each branch of the service. This year’s program includes “A message from a Veteran and his Veteran Dad” as well as a special message from Staff Sergeant Patrick Maloon an active duty soldier who graduated from PCHS in 1988. Elementary students will perform music numbers “God Bless America” and “Thank You, Soldiers” under the direction of PCES Performing Arts Teacher Mark Arthers. Veterans and friends, parents and the entire community is invited to celebrate are encouraged to attend. Refreshments for Veterans, visitors, and guests will be served in the cafeteria following the program. For those unable to attend, the program will be live streamed from the school’s website (http://www.sad4.org). Long distance guests are encouraged to visit the site fifteen minutes prior to the event to establish a connection.